If there’s one word that can describe Viva Technology (or “VivaTech” for short), it’s that it’s a ginormous conference. While it was just the first edition last year, 45,000 people made their way to Paris to talk about all things tech. VivaTech is back again this year, June 15-17. VivaTech is co-organized by the advertising company Publicis and major newspaper Les Échos. Last year, 5,000 startups, 6,000 CEOs, 250 investors and 5,000 students were there at some point during the three days of the conference. There were a ton of startup booths, as well as eight stages. And the team behind VivaTech plans to do just that once again. Everything will be refined, as the conference was organized quite quickly last year. So this time, they have more time to prepare and line up their speakers and startups. 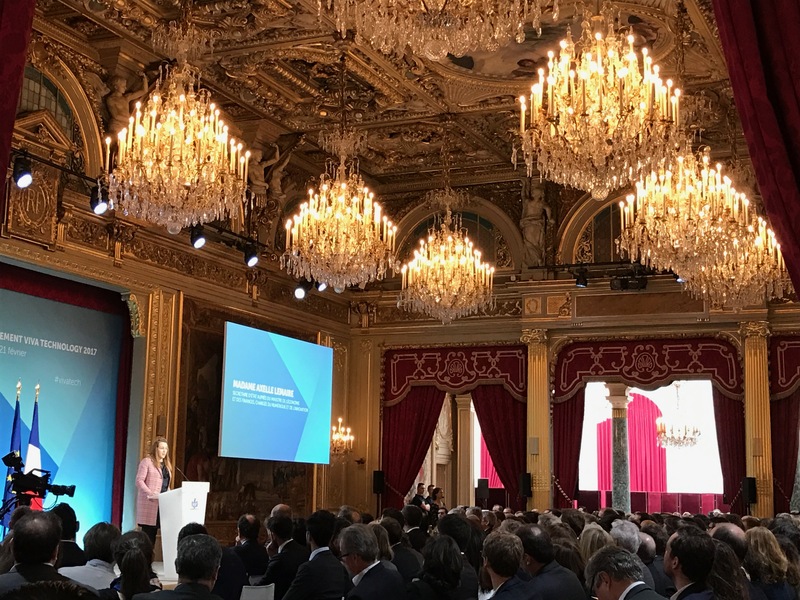 Today at the Élysée Palace, French president François Hollande, French digital minister Axelle Lemaire, Publicis, Les Échos and a bunch of other people introduced the event. It was a big splashy event with around 200 people from the tech ecosystem. “The first time I heard about VivaTech, I thought ‘oh no, not yet another big thing,’” Axelle Lemaire said. But she then said that France needed a major tech event to compete with other countries. “Today, VivaTech is clearly a success. That’s why they want to do it again, but this time, they’ll pay attention to details to turn it into a community venture so that it can become a major innovation event in France and across the world,” she said. She then listed many of her initiatives as digital minister. I’ve covered many of them on TechCrunch — La French Tech, the French Tech Ticket, the French Tech Visa, the Digital Republic bill, the gender diversity initiative and more. French president François Hollande spent most of his speech making jokes — he only has a couple of months left as the French president after all. “Maurice Lévy is good when it comes to communication, and I should have talked with him more often,” he said. It’s weird that French politicians have been fascinated with CES like it’s the ultimate tech event. There are many tech events out there, but somehow CES is the gold standard for ministers, political candidates and French presidents. Hollande also listed all the reasons why France has become more favorable for startups. Arguably, it has never been easier to create a startup in France, and he hopes that the next French president is going to follow the same path. Other speakers included VivaTech’s co-directors Julie Ranty-Déchelette and Maxime Baffert. They announced the first partners of Viva Technology. 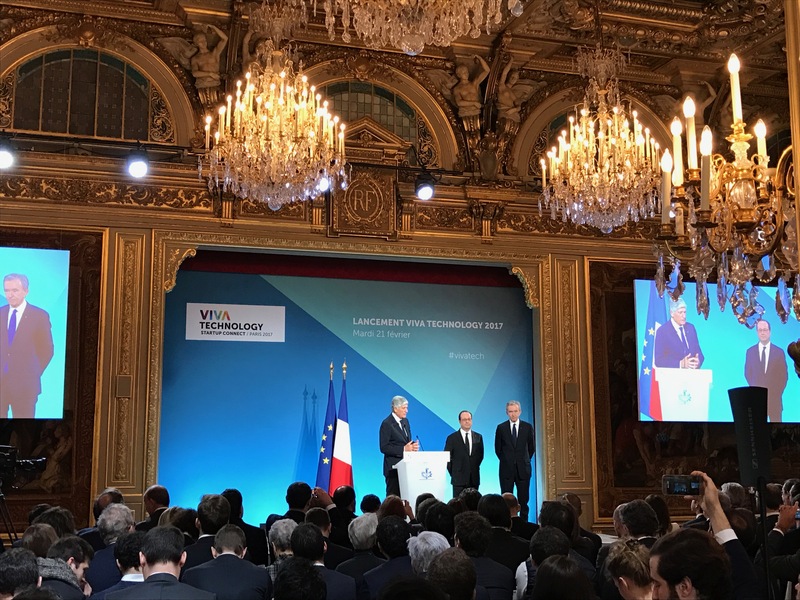 Maurice Lévy announced some of the first speakers, such as Peter Fenton from Benchmark, Eric Schmidt from Alphabet, Daniel Zhang from Alibaba and Dan Schulman from PayPal. In short, VivaTech 2017 is going to be like VivaTech 2016, but more polished. There will be fewer stages, so the content should be more focused. There will be big companies like AccorHotels, Air France KLM, Carrefour, LVMH, TF1 Group and more. And finally, there will be thousands of entrepreneurs. Les Échos CEO Francis Morel was also on stage to talk about the event. And LVMH CEO Bernard Arnault was also at the event. At first I didn’t really understand what Arnault was doing there, but then I remembered that Arnault is the main investor in Les Échos.